Opened on 24 July 1848. It was closed for goods traffic on 6 September 1976. Now Mhuine Bheag, a halt from 31 April 1988. "Architect: Sancton Wood Wonderful symmetrical composition with a stationmaster’s house in the upper floor of the central building. His quarter have a small balcony over the ticket hall.The building suffers visually from the large expanse of tarmacadam out front." From - archiseek.com/2013/railway-station-bagnelstown-co-carlow/ Something that shouts at me about this and many other Lawrence photos - they would have looked a lot better with the windows closed. Discuss. 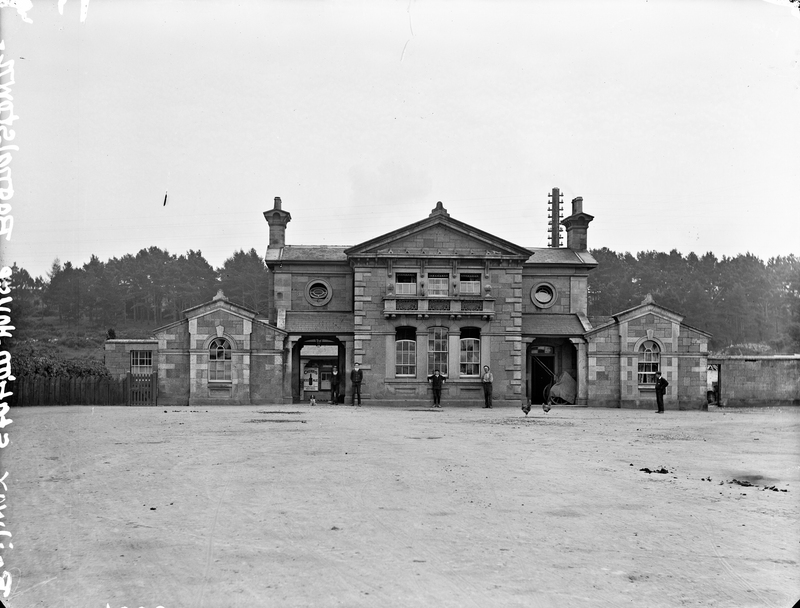 Per the DIA, this was designed by Sancton Wood, who also designed Heuston Station (then Kingsbridge) and several other "picturesque Gothic" stations. A note about the windows. All the floors were untreated wooden boards and scrubbed clean by hand, with cold water. To stop the wood warping they had to be dried quickly, hence the fresh air.